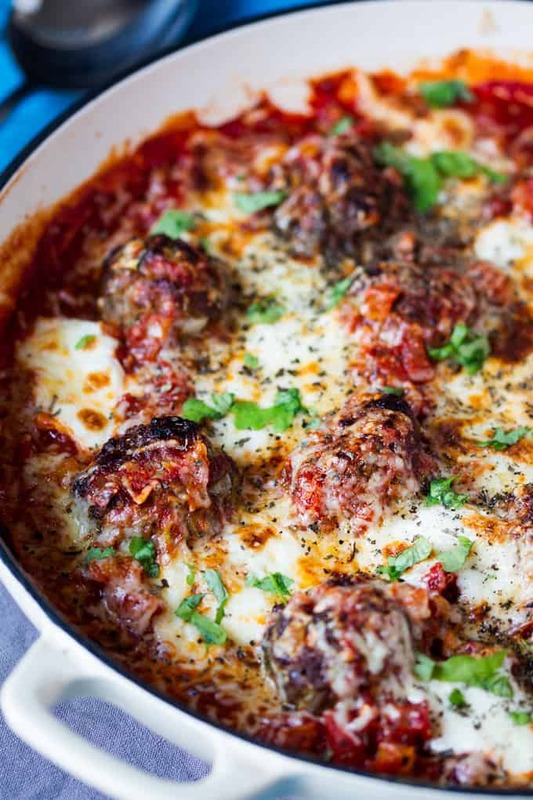 Juicy meatballs with hidden veg, served in a tomato and pepper sauce with gooey melted cheese. 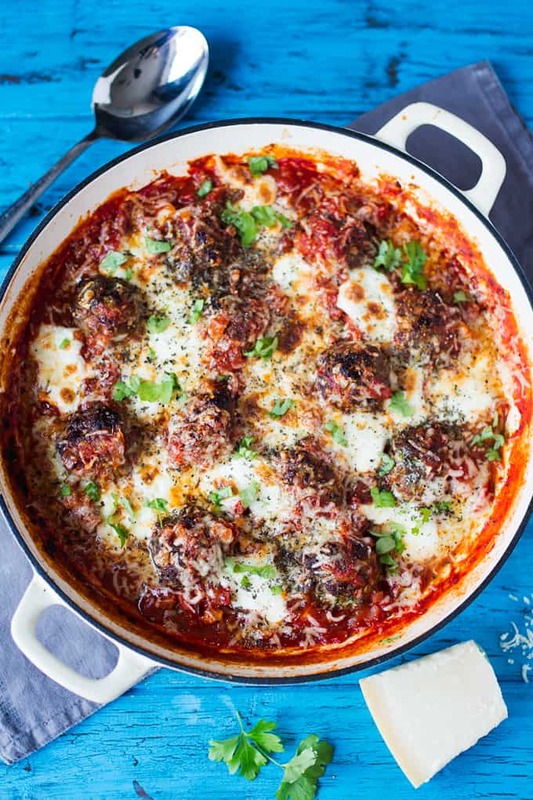 These Hidden Veg Meatballs are a great way to get the kids eating more veg without them knowing (or at least complaining too much)! 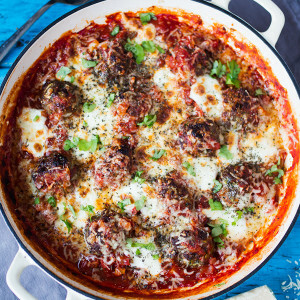 My kids claim they don’t like courgette, mushrooms and onion, but that doesn’t stop them from eating these meatballs with sighs of pleasure. If there’s one thing I love in life, it’s fooling my kids into eating their veg. I don’t know why getting one over on them is so much fun, but now I think about it, I do seem to spend a fair amount of my time either fooling, fibbing or bribing them. Me:‘erm, I’ll tell you later – eat them all up first’. Me: ‘Yes of course, I’ll pay you a meatball for emptying the dishwasher for me’. Oh dear, that was fooling, fibbing and bribery all in the same conversation. I’m expecting my mother of the year award very soon…. Coming back to the meatballs, they feel like hearty, not-very-good-for-you comfort food. But they’re healthy! Yes, there’s cheese in there, but I use reduced fat cheese (the low fat mozzarella still stretches nicely). I’ll sometimes serve it with a mix of courgette spaghetti and regular spaghetti to make it even lighter, and it still goes down just as well (I could never forego my regular pasta completely, courgette spaghetti is great, but it is NOT real spaghetti). Do you fib to your kids to get them to eat things they say they don’t like? 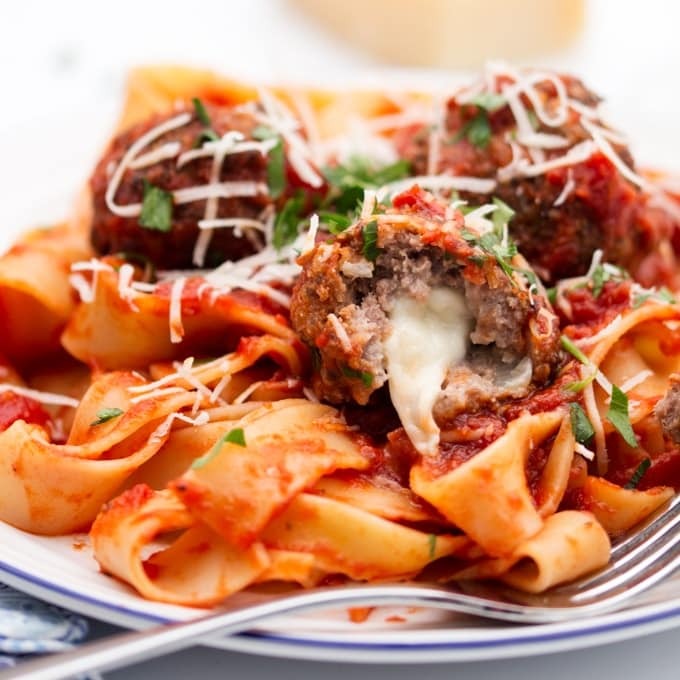 Juicy meatballs with hidden veg, served in a tomato and pepper sauce with gooey melted cheese. 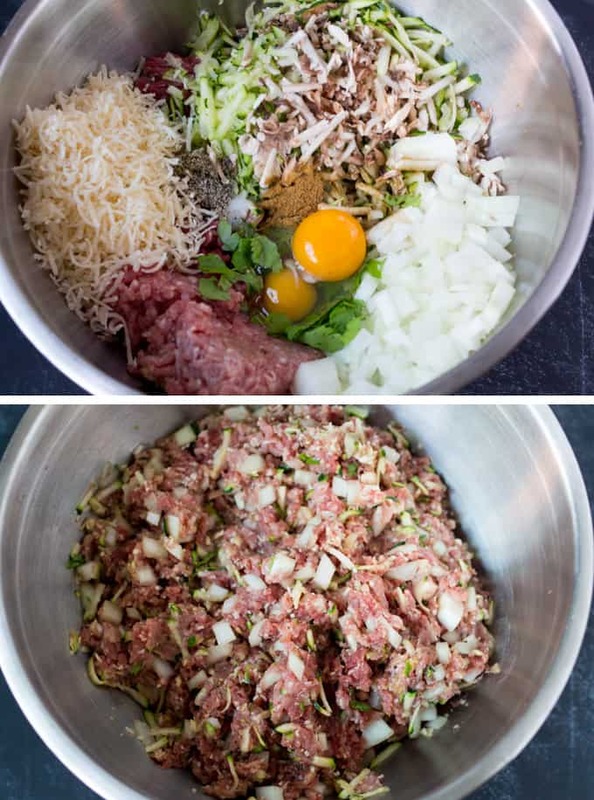 Mix all of the meatball ingredients in a bowl with your hands. Squash it all together but don’t overmix as this will make the meatballs tough. 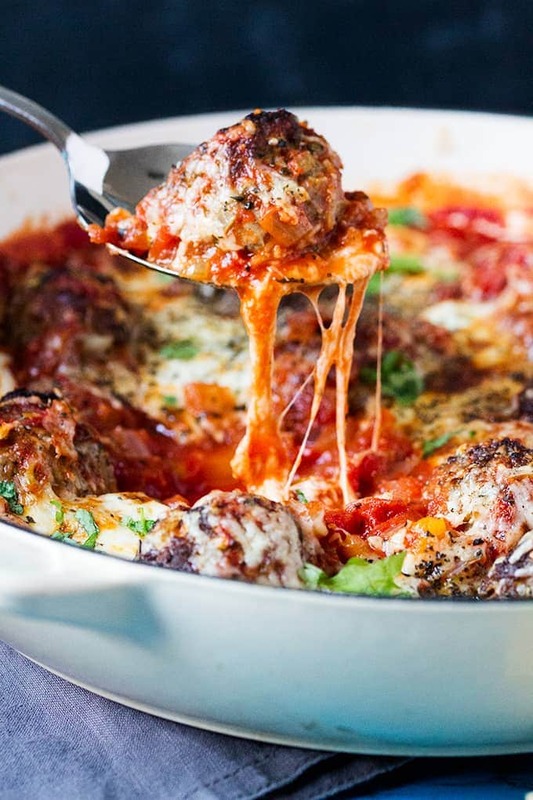 Shape the meatballs into little balls – the size of a golf ball – and place them on a baking tray. Put in the oven for about 20-25 mins. Keep an eye on them toward the end of the cooking time and turn the oven down a little if they start going too dark. They will seep a little in the oven due to the moisture in the courgette (but they’ll still taste great). Whilst the meatballs are cooking, make the sauce. Fry the onions in the olive oil on a low heat for about 5 mins. Add the garlic, and red pepper and cook for another couple of mins. 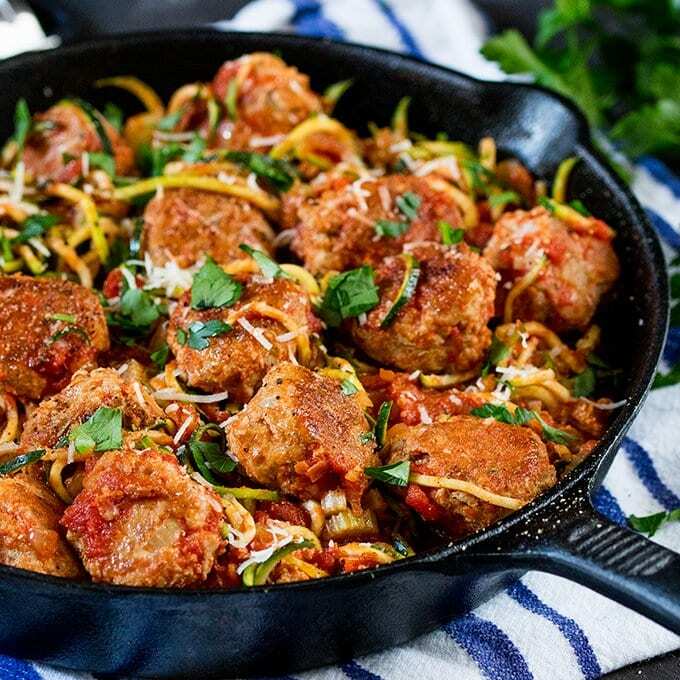 Drain the spaghetti and serve with the pan of meatballs (I usually serve 4 meatballs per adult and 2-3 for children) and garnish with some grated parmesan and parsley or basil. Any leftover meatballs and sauce should be cooled and then frozen (you can freeze the meatballs and sauce together). To reheat, simply defrost thoroughly and heat through in a pan for about 15 minutes until the meatballs are hot all the way through. 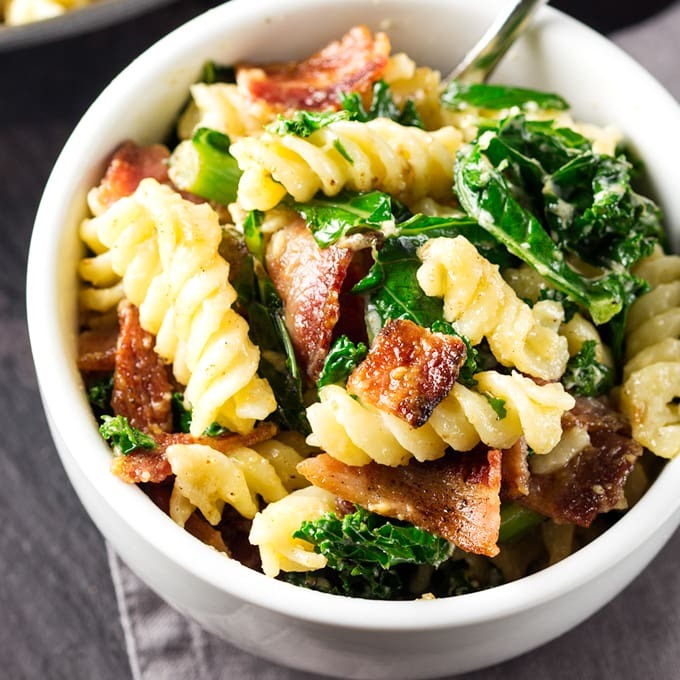 Do you think this would pair well with parmesan risotto? HI! I have a few questions about your recipe. I’m living in Asian so there is no way I can find Worcestershire sauce. Is there any other sauce I can use instead?? Also, will the meatballs be as delicious if I contain them in the freezer so I can use them later? Hi Claire, you can freeze the meatballs. I find it’s better to cook them, then freeze them – just make sure you thoroughly defrost before reheating. Hmmm, worcestershire sauce has quite a tangy, salty taste to it. You only need a little, so I think i’d replace it with A1 steak sauce or HP brown sauce, or if you can’t get those, then try a little bit of tamarind paste mixed with a couple of drops of soy sauce. Ooooh so you’re only supposed to lie to kids to get them to eat their veggies? Not 28 year old men…. Can I use the same tricks on Chris because I’m pretty sure he’s going to gobble down these meatballs like there is no tomorrow! I can’t wait to make these for him! Just look at that cheese stretch! Also, I’m with you! I love my courgette spaghetti but I could never give up pasta entirely! 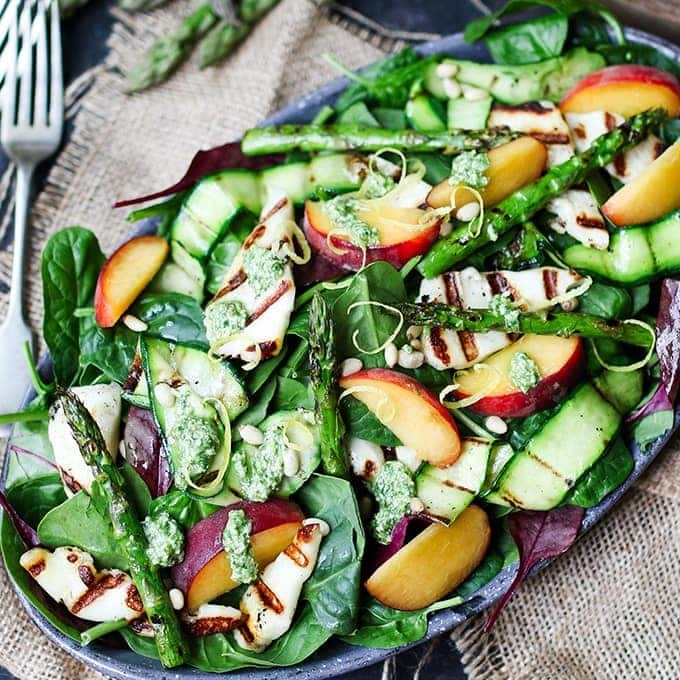 What a great way to enjoy more veggies! These meatballs look sensational, Nicky. What you call fooling, fibbing and bribery, I call smart parenting. And yes, I try to trick mine into eating more veggies as much as I can, but those wee devils are becoming too clever. Thanks for this clever recipe – a great way to fool the kids.